The Ashes and the mystique surrounding the small urn which resides at Lord's is one of world sports best-known stories. This personal gift forms the symbol of superiority in the oldest of cricket's ongoing national battles. In recent years The Ashes has expanded dramatically, witnessing unparalleled growth in terms of ticket sales, crowd attendances, and in particular, everything commercially associated with it. The Ashes Bail interweaves all these Ashes originators. The match between Australia and England was the Third 'official' or scheduled Test of the 1882-83 series. Another match, now described as the Fourth Test match, was played afterward, but this was not deemed to be part of this first 'Ashes' series in Australia. The Ashes Bail is approximately 292mm long and consists of the bail and letter opener which bears the inscription listed above, and featuring the distinct monogram 'JMC' (Janet Marion Clarke). It is now well documented that Lady Janet had previously given the Ashes urn to Ivo Bligh. The mystery surrounding the actual contents of the Ashes urn will most likely never be resolved, certainly not from a scientific viewpoint or using forensic analysis. These publications all have contributed to the rumors and mystique surrounding the Ashes Bail, but all along Lords reserved its authorative judgement. A more recent publication released in 2009, 'Ashes History' by Bernard Whimpress which is authorised by the MCC, lists four possible explanations regarding the contents of the Ashes. This further confirms that current research is unable to definitively prove one possibility over another. ashes, and later after the Tests had been completed, then containing the burnt ashes from the bail used after the final Test match. This allows the possibility, the bail featured in the victory of the first Ashes series 1882-1883 and presented to the family (modified as a letter opener), is in fact the 'partner' of the cremated bail, encased in the urn known as the Ashes urn. with exploring the concept of the mythology of ' the Ashes'. Glenys presented a talk specifically about the Ashes at Lord's in 2005 ('The Myth of the Ashes - How a Concept Became a Reality') and played a major role in MCC's 2006/07 Ashes Urn Exhibition Tour of Australia, during which she was able to further develop her theories. Whilst she accepts that it may never be possible to prove for certain a definitive sequence of events she continues her research and hopes soon to publish a unified theory on the history of the Ashes Urn. The letter opener was made from a bail used in the 1882-1883 Ashes Test won by England. Legend has it that the other bail of this set was burnt and the ashes placed in an urn presented to English captain Ivo Bligh. Another account holds that the urn was given to Bligh after a friendly match at Sir William Clarke's home in Victoria. Bligh later presented the knife to the Clarke family in return for their 'gift'. The NMA further utilised the Letter Opener with an external exhibition and assisted in the development of a number of displays for external organisations. In 2006, this included displaying the Ashes letter opener at the Lodge during a dinner held by the Prime Minister for the touring English cricket team. 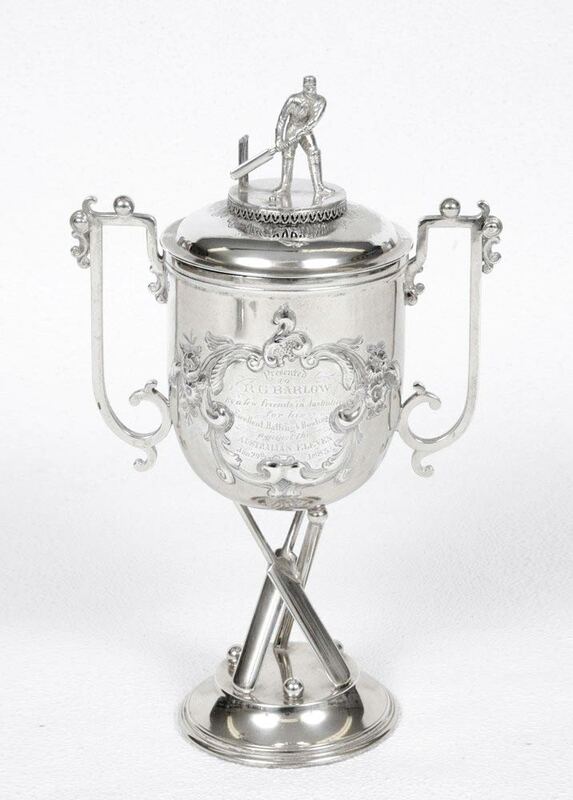 Historic silver cup/trophy 'Presented to R.G. Barlow by a few friends in Australia for his excellent batting & bowling against the Australian Eleven. January 29th 1883'. An historic and unique early trophy presented to Barlow following the match, it was during this Test match that some ladies burnt the bails used in the match, once the game was won, and placed the 'Ashes' in a small urn and presented it to the victorious captain of the English team Ivo Bligh, he had won back the ashes of English cricket. This is the same match from which the bail featured on this site originated. William Hammersley from the MCG, who also helped Tom Wills write up the rules for Australian Rules football.